Turn meal time into stew time with the Newman's Own Grain-Free Premium Beef Liver & Vegetable Stew Canned Cat Food. Made with real grass-fed beef liver and beef broth as the top ingredients along with fiber-rich carrots and potatoes, it’s all the nutrition your furry one needs with all the flavor he’ll find irresistible. The grain-free recipe is slowly simmered to enhance the stew-like flavor for a gourmet dining experience that also provides essential vitamins, minerals, taurine, and omega-3 fatty acids from fish oil for healthy skin and joints. 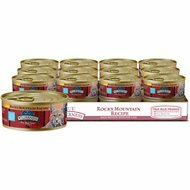 It’s great as a complete and balanced diet for cats of all ages and even kittens, and can be used as a meal on its own or a delicious kibble topper. Plus, the broth is a great way to add much-needed hydration to your cat’s diet, and contains no artificial colors, flavors, or preservatives. 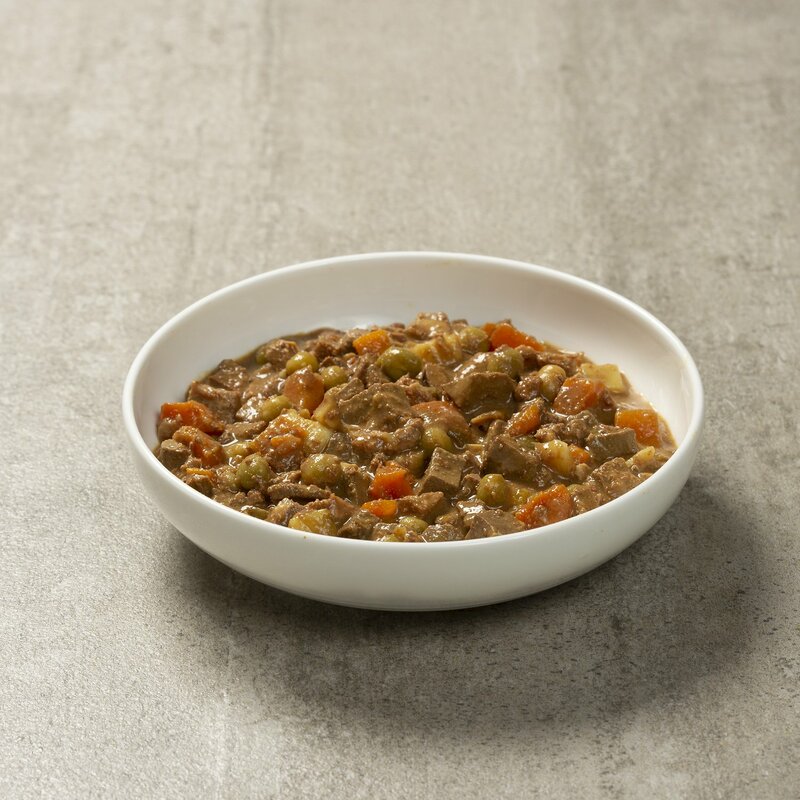 Made with real grass-fed beef liver and beef broth as the top ingredients plus veggies in a slow-simmered stew. Beef Liver, Beef Broth, Carrots, Potatoes, Fish Oil Minerals (Calcium Carbonate, Potassium Chloride, Ferrous Sulfate, Zinc Proteinate, Zinc Oxide, Manganese Proteinate, Copper Proteinate, Calcium Iodate, Sodium Selenite, Sodium Phosphate, Manganous Oxide), Taurine, Vitamins (Vitamin E Supplement, Niacin, Pantothenic Acid, Thiamine Hydrochloride, Riboflavin Supplement, Vitamin A Supplement, Pyridoxine Hydrochloride, Vitamin B12 Supplement, Folic Acid, Biotin, Vitamin D3 Supplement). I have a Ragdoll cat and she didn't care for this food. Not sure why the ingredients seem good. I tried it for four days and she would not eat it. Whole case and it’s a bust. Cat won’t eat much of it. Just the gravy and leaves the vegetables and bits of meat behind to dry out. 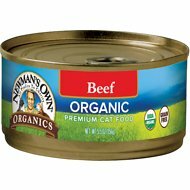 Desperate for healthy grain-free ORGANIC food for our cats - so few choices and I was really hoping for this one, but they won't touch it. Sigh. Thank goodness Chewy has wonderful customer service so we didn't have to lose all that money. Again - Chewy please allow buying one-time samples of foods to see if the cats will eat it? 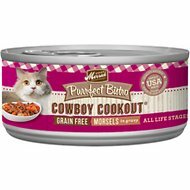 I was fortunate enough to be able to buy one can of this as a single to make sure my cats would like this. They do.....It literally looks like human beef stew....I will say the chunks of meat were quite large.....My cats left some of the bigger pieces and I had to cut them up. 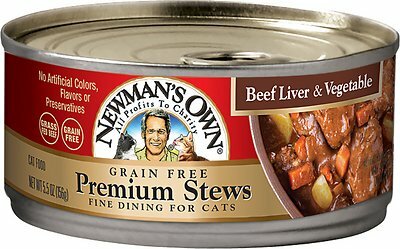 So, if you have a cat with few or no teeth, or, a cat that just does not like large pieces of meat, I would suggest you pass on this unless you are willing to chop it up....... Other than that....great ingredients with plenty of meat and broth.....The current ingredient deck has no carrageenan and no synthetic vitamin K which are pluses in my book ! Will order again...Hope to try the lamb in the near future !